In the 13th straight weekend of “Yellow Vest” demonstrations in France, protesters showed no sign of letting up pressure on the government and did not appear appeased by concessions by President Emmanuel Macron, writes New York Times. There were scattered acts of violence as protesters and the police clashed in marches in Paris and southern French cities on Saturday. Scuffles broke out near the Avenue des Champs-Élysées and by the National Assembly in central Paris. Motorcycles and trash cans burned as throngs moved in a wave through Paris, and protesters set fire to a car belonging to an antiterrorism unit in front of the Eiffel Tower. One protester was severely wounded when he tried to pick up a “sting-ball grenade” used by the police to disperse crowds and it exploded in his hand. But the number of protesters who took to the streets in the capital and in southern France was lower than in previous weeks. Some 51,000 people marched across France on Saturday, according to the police, about one-fifth as many as turned out for the first Yellow Vest demonstration, in mid-November, and down from 84,000 in mid-January. The turnout has been trending downward for weeks, but a majority of French people say they still support the Yellow Vest movement, even as Mr. Macron’s popularity has been creeping back up. The protesters’ demands have shifted from scrapping a gas tax rise — since withdrawn by the government — to a more amorphous demand for higher wages and lower taxes, especially on “essential” foodstuffs. Some in the heterogeneous movement have shifted into the political sphere, forming lists of candidates for the coming European elections. That move is not supported by all of the Yellow Vests, however. In Paris, the mood turned sour on Saturday as about 4,000 demonstrators reached the National Assembly, which faces the Seine. Witnesses and the police said that a young man trying to take pictures of the demonstration was severely injured as riot officers fired tear gas and stun grenades to hold back the crowd. A witness said that the young man had tried to push away a grenade but that it had exploded, and he lost four fingers on his left hand. The police had been responding to masked militants — the so-called casseurs, or vandals — who have infiltrated each of the demonstrations and who were trying to break down the barricades protecting the Parliament building. They threw stones at the police and urinated outside the building, prompting officers to respond with batons and the types of rubber projectiles that have been criticized for causing numerous injuries during demonstrations. 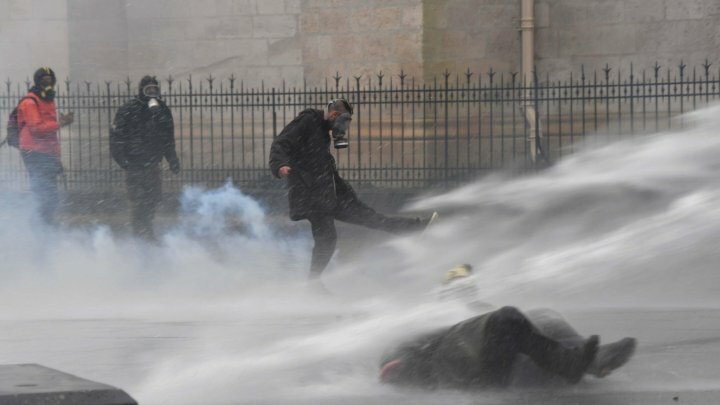 This month, an administrative court upheld the police’s tactics in the government’s struggle with the Yellow Vest protesters. Some casseurs are part of the Yellow Vest movement, but not all, and their violent ways are rejected by many in the movement. At the same time, some Yellow Vests acknowledge their complaints might not be heard were it not for the casseurs. On Saturday, demonstrators burned about a dozen luxury cars in Paris, according to French news outlets, and smashed bank windows and A.T.M.s along the protest march route. Thousands also marched in Bordeaux, Toulouse, Marseille and Montpellier. The police made nearly 40 arrests in Paris. Across the country, demonstrators shouted a familiar refrain — “Macron resign!” — suggesting that the French president’s troubles were far from over. Lawmakers from his political movement, Republic on the Move, have been targeted in acts of violence recently. The latest was an arson attempt late last week at the Britanny home of Richard Ferrand, the president of the National Assembly and a close Macron ally. The attackers’ identities and motives remain unclear. Politicians denounced the arson attack on Mr. Ferrand, who posted pictures on Twitter of his scorched living room. “Nothing justifies intimidations and violence toward an elected official of the Republic,” Mr. Macron wrote on Twitter.